Garden hoses are one of our most important helpers in the garden, after all, our green needs regular water. It represents a very efficient alternative to a full bucket of water or huge, filled watering cans. Basically, garden hoses differ in the material used, in their flexibility and their inner diameter, but also in their handiness or in terms of their maximum pressure. The garden hose should preferably consist of high-quality material and its properties (length, maximum pressure, inside diameter) should meet your project. The flexibility/kink resistance of the hose makes your work easier and contributes to its durability. We have already noticed that there are many different garden hoses on the market at very different prices. So that you know how you can rate garden hoses and it is easier for you to find the right hose for you, we show you at this point what is important. In our guide, we have already explained to you how you can determine the correct length of your future garden hose. It is crucial that this is indeed long enough to reach all irrigated areas, but at the same time, it is not oversized. Otherwise, you do not just have to fight with an unnecessarily long hose. Because the water pressure decreases with the length of the garden hose, it can also happen that the water jet does not have enough pressure at the end. Not only for you, but also for your plants and the animals that are in your garden, it is important that your garden hose is as free of pollutants as possible. Pay attention (especially with PVC hoses) to the manufacturer’s instructions and be very careful with “cheap hoses”. Plasticizers, lead, barium, and cadmium have no place in your garden hose. High-quality materials also contribute to a longer life of your garden hose. So rather invest something more – for the sake of you and the environment. On the one hand, this is about being able to roll up and stow the garden hose and, on the other hand, about the durability: If a garden hose kinks, cracks can develop in the long run and we naturally want to avoid that. When buying, make sure that the hose is flexible and kink-proof. Since you certainly want your garden hose to survive more than just its first use, be sure to pay attention to the maximum pressure it can withstand. This must be at least equal to the pressure at which the water comes out of the tap, whether it is a tap or your deep well pump. At this point, be more generous and choose a garden hose with a higher bursting pressure. In order to choose the right inner diameter, you should know which outer diameter your faucet or deep-well pump has (or the connection to which the garden hose should be mounted). The inner diameter of the water hose must correspond to the outer diameter of the tap. This criterion is subordinate to the others because you can also simply buy an adapter with the appropriate size, in order to mount your garden hose quite easily. Some garden hoses are supplied with helpful accessories such as various nozzles or showers or adapters for connection. If you need them, you can save time and money this way. Also, for example, hose reels or reeling drums or hose boxes with automatic rewinding to extra equipment include, with the help of which you can not only transport your garden hose easily but also kink-free and thus store gently. And without the garden hoses, watering can be a tiresome and clumsy task. That’s why in this post I’ll review some best garden hoses to boost your gardening. 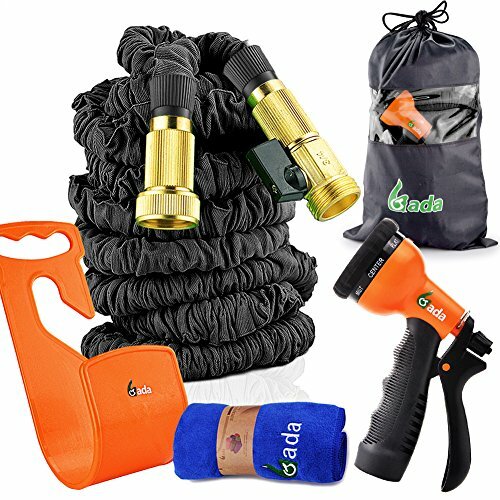 The Gada Strongest Expandable Hose is our greenery enclosure hose pick at its cost as well as for its toughness, construct quality, and guarantee. And this is how it prevents chemical reaction between the brass and the inner tube that made all the other hoses to burst. It’s made of a special new material that solved 90% of its previous design malfunctions and is the only garden hose on the market today. Gada expandable is so lightweight, does not tangle and the PSI and fittings are better than others. The hose comes with a spray nozzle as a gift. The strongest expandable Hose is manufactured like a tank, with overwhelming rubber materials and connectors of nickel plated metal. Due to this plating, any lead in the metal won’t get into the water, and the couplings ought to hold up better after some time. Rubber likewise minimizes tainted from plasticizing specialists, and the thick material adds to its wrinkle resistance. While not absolutely wrinkle confirmation, in our tests the expandable hose surely crimped far not exactly the identical crossover rubber/PVC hose. Water Right 400 series polyurethane meets FDA measures for drinking water contains no lead, phthalates, or BPA, and Water Right uses a without lead metal compound in its fittings. Super slim, lightweight and drinking water safe by design, the 50 Ft long Water Right 400 garden hose is soft, flexible and effortless to use. It also uses a safe drinking water hose. Their polyurethane is safe to drink by using NSF grade polyurethane and is 100­ percent free from toxic chemicals such as lead. BPA and percolates often found in other garden hoses. This is super light and very much built the hose. Unquestionably worth spending additional for if weight is critical to you. We can honestly say that you have never used anything like it. Manufactured in Oregon, using only top quality materials from Bayer Material Science. However, do take note of that the most slender measurement can prompt weight issues when utilized with sprinklers and spouts. The material used in the garden hose eliminates permanent kinks, cracks, and leaky connections. The garden hose comes in 4 colors so buyers of this product found it suitable to match their personal preference. 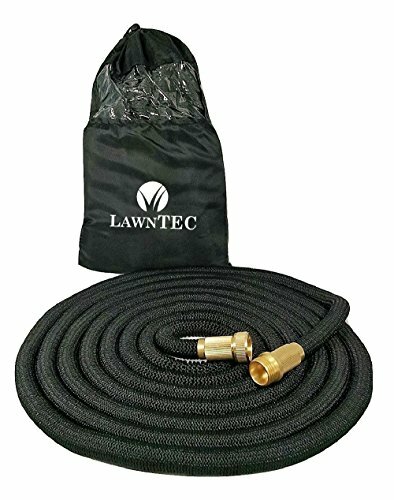 The LawnPRO 50’ Expanding Garden Hose is the strongest and is available on the market today. 5,000 Denier woven wrap is stronger than all other expanding hoses And this is how it fittings are standard 3/4”. 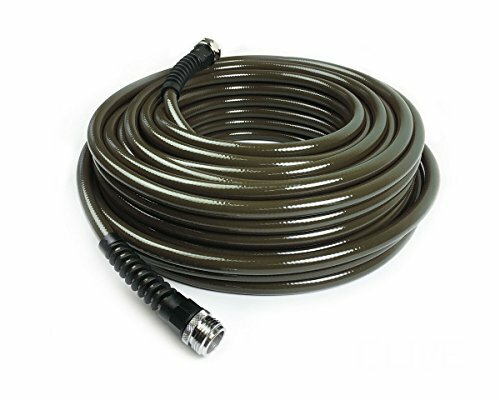 This hose will work with any standard garden hose faucet. It’s made of a special new material that solved 90% of its previous design malfunctions and the expanding hose shrinks to under 20′ and under 2.5lbs. The solid copper fittings were designed specifically to handle hot and cold environments and to accommodate high water pressure. You can use it for garden watering, car washing, pressure washing, power washing. A wide range of other applications where utilizing the advantages of a retractable hose will come in handy. So, this specific model can be a good choice to perform your garden watering job. This cool garden hose has capable of expanding to 3 times of its length with water in order to provide the inner tube strength and protection from external injuries. 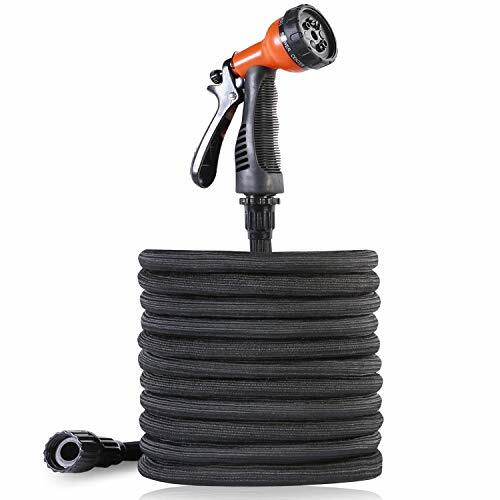 That’s why VicTsing 50ft Expanding Hose stands out in this competitive list of best heavy duty garden hose is made from durable latex core and high strength polyester outer for excellent durability. The solid brass connector will not break. And this is how it prevents chemical reaction between the brass and the inner tube that made all the other hoses to burst. It has included storage bag makes it easier carry for you and the lightweight design is for convenient use. 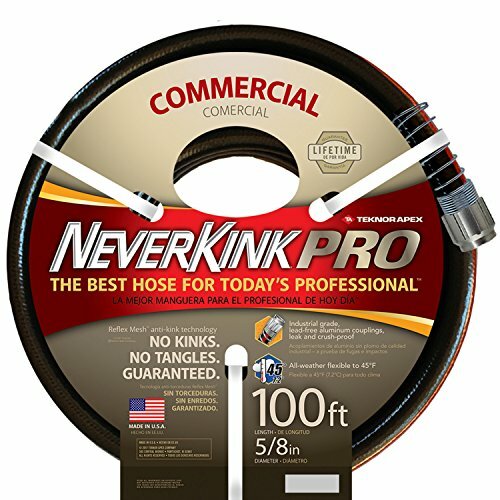 Finally, the ultimate heavy duty garden hose from NeverKink 8844-100 Series. The reinforced construction of this hose guarantee no kinks or tangles, the patented Reflex Mesh technology ensures a hose that’s easy to maneuver. The reinforced construction of this hose guarantee no kinks or tangles, the patented Reflex Mesh technology ensures a hose that’s easy to maneuver. The biggest benefit is that Industrial strength couplings are made of lead-free aluminum. Leak-proof and crush-resistant, a heavy duty steel coil prevents kinking at faucets like common vinyl and PVC garden hose do. And yes, you’ll be happy to know that this awesome garden hose has contained MicroShield, anti-microbial protection, guards against mold. Mildew that can cause hose deterioration. The series 4000 Never Kink is flexible to 45 Degree. How long should your garden hose be? On the market, there are garden hoses with different lengths. But is less more here or should you be as generous as possible? After all, you certainly do not want to unnecessarily drag a hose behind you, still hang after a short time. Here’s why we’ll tell you how to choose the right length for your garden hose. The first thing to do is to measure: To get the most accurate result, it is best to use a measuring tape or yardstick. Then you measure the length and width of the property to be irrigated. For example, we take a plot of land measuring 20 meters in length and 15 meters in width. True to the motto “Not for school, for the life we learn”, we now strive for our mathematics skills. Remember the sentence of Pythagoras? Intermediate result: According to this calculation, the length of the hose should be 25 m. However, you should add about 10 to 20% of the length according to a rule of thumb. This is because the tap is rarely directly on the ground and should also be added to the height in which you hold the hose. Likewise, unevenness of the terrain or the like is added. Bottom line: The garden hose should be (in our example) 30 meters long. How many inches and how much bar does your garden hose need? The units “inch” and “bar” are crucial in connection with the connection of your garden hose to the faucet, to sprinkler or to your deep well pump or another taping point. These have a pressure port indicated in inches (“). At this point, the water hose is mounted. For a garden hose, it is the inside diameter, which is indicated with an inch. Of course, the connection of the hose and the faucet or deep-well pump or the like must match. This means that the inner diameter of the hose must correspond to the outer diameter of the pressure connection. If your tap has a different port size, you can simply buy an adapter. With this, the garden hose can be easily mounted. Now we come to the second point: the unit “Bar”. This indicates the pressure with which the garden hose comes to a maximum. For example, if your faucet or deep-well pump delivers 6 bar pressure, you will need to buy a hose that can hold it. Of course, it is better if it can withstand more than the existing pressure. Incidentally, in some cases, a “minimum pressure” is given, which the garden hose needs in order to expand completely. A garden hose must have a diameter corresponding to the connection and a sufficiently high maximum pressure. What materials are garden hoses made of? The topic of “materials” is mostly about the robustness and thus the lifespan of products, but also about how health-friendly and sustainable they are. So there are water hoses, which are made of a food-safe material , suitable for drinking water or are free of pollutants or particularly environmentally friendly . Here you should read the manufacturer’s information carefully. What accessories are there for your garden hose? To make your life easier with your garden hose or gardening, there are practical accessories. We will briefly introduce you to the most important. Whether simple water jet, shower, drizzle, flat jet, sprinkler or pressure jet: Different plants and fields of application make different demands on the quality of the water jet. There are a variety of nozzles or showers that you can buy individually or in sets. Some garden hoses are even included in the delivery. In addition to these practical helpers, there is something else that counts as “standard equipment”: So that your garden hose gets no kinks and cracks over time, you can use hose holders, hose reels or reeling drums . With their help, you can store your garden hose safely and carefully and, in the case of the hose cart, also easy to transport. The automatic rewinding on some of these products saves you work and is an added bonus. What types of garden hoses are there and which one is right for you? Due to the different, sometimes very special, construction methods of these garden hoses each result in advantages and disadvantages. So you can find out more easily, which is the right garden hose for you, we have these advantages and disadvantages, as well as more information about the different garden hose types, summarized in the following post. How does a normal garden hose work and what are its advantages and disadvantages? A garden hose belongs to the pressure hoses. That is, the water is passed through it with pressure. This makes a garden hose the flexible and portable extension of your water pipe. A standard garden hose consists of three layers as standard: Between a protective outer jacket and the inner tube, a fabric is usually used. If you want to buy a normal garden hose, you have a wide choice of lengths, materials, inside diameters and extra features. We will take a closer look at these points in our guide. Another advantage is the large price range, which starts with very reasonable prices. As a result, a suitable garden hose can actually be found for every purse. But you should still be careful with cheap hoses from no-name manufacturers, even if it comes to pollutants and the like. But more on that later. Since there is a large selection of normal garden hoses, the accessories are also extensive. Depending on your needs, you can therefore retrofit at any time and thus cover many areas of application. The disadvantage of these water hoses is the material: If it is cheap plastic, the hoses are fast hard and inflexible. This not only makes them heavier or unwieldy, but also brittle and cracked over time. In addition, the material may be contaminated with toxic plasticizers and heavy metals. So always pay attention to high quality material and flexibility in a garden hose. How does a flat hose work and what are its advantages and disadvantages? The function of a flat hose is the same as that of a normal garden hose. The difference lies in the structure: A flat hose is, as its name suggests, flat. Only when the hose fills with water, it gets its round shape. Due to its shape, a flat hose occupies significantly less space, which can be of great advantage in small gardens or on a balcony. Of course, material and workmanship are also crucial for the quality and durability of the water hose, but this is the case with all garden hoses. The only downside is the smaller selection of flat hoses. Here you have to check if your required length, the maximum pressure and the desired inner diameter are available. If you are not sure what properties your future garden hose should have, or what you should generally consider when buying, you can read the most important of these points in our Garden Hose Guide below. How does a spiral garden hose work and what are its advantages and disadvantages? The following applies: A spiral garden hose works just like any other garden hose. The peculiarity is its shape, which resembles a long spring, which can expand and contract again. Since a spiral garden hose contracts again after being stretched, it does not have to be rolled up after use, which of course is very convenient. It is particularly suitable for small gardens, balconies but also for connection to a well. A disadvantage may be the small selection of spiral hoses, if you are looking for a certain maximum pressure (bursting pressure), a certain length or the like. Here you have to see if the offer meets your requirements or whether it is possible to compensate for missing items with accessories. Also, you should pay attention to the quality of the material, this is one of the most important selection criteria, which we will inform you in more detail later. How does a dripping hose work and what are its advantages and disadvantages? Drip hoses and pearl sprinklers are special types of garden hoses. What you would like to avoid with a normal garden hose, is deliberately provided here: The hose has many small holes, through which the water can drip out over the entire length. This type of irrigation is also called droplet irrigation. Thanks to its unique design and the droplet irrigation that is possible with it, a trickle or drip hose is clearly in the advantage when it comes to watering vegetable beds or delicate plants. These do not tolerate a hard and wide stream of water. At the same time, this specialization means that the percolating hose and its relatives are not suitable for any kind of garden irrigation or, for example, for refilling the pool. In addition, the water pressure must not be too high. Here you should note the manufacturer’s information. How does a flexible garden hose work and what are its advantages and disadvantages? Flexible garden hoses are still relatively new on the market, but are seen as a trend. They also work like a normal garden hose, but can expand and contract again, even though they do not have a spiral shape. This is often referred to as the “expander effect”. Flexible garden hoses not only look innovative, but are very popular because of their handiness. A stretchable garden hose is inherently very flexible and its flexibility makes it kink-free at the same time. This also contributes to its durability. In addition, its light weight is of course pleasant in gardening and the tube can be easily cleaned afterwards. A disadvantage is, as with all special garden hoses, the small selection. Since you should determine in advance which claims you make of your future garden hose (length, maximum pressure, material, etc. ), we have put together a few tips and explanations in our guide. Then you can also check if the right choice for you is in the selection of flexible garden hoses. Incidentally, flexible garden hoses are a bit more expensive compared to other garden hoses. Whether this investment is worthwhile for you, but only you can decide for yourself. How can I extend the life of my garden hose? Give your garden hose some time: Also, if it should go fast, always roll out your hose carefully, before you turn off the tap. Do not overuse your garden hose: Your faithful helper does a lot for you, so treat him carefully and do not drag him carelessly along the floor or along your house facade. Do not let your hose get under the wheels: If you park your garden hose in the garage between, it should be so that you can not drive over it with your car. Of course, this also applies to your driveway, etc. Do not put pressure on your garden hose unnecessarily: If you no longer need your hose, turn on the tap and release the residual pressure. Last but not least, the choice of Best Garden Hose 2019 for your garden totally depends on your personal preferences. Remember that the right garden hose is one of many essential tools to help keep your outdoor space clean and enjoyable.